Mrs. Yollis' Classroom Blog: Student Blogging Challenge :: Playing Outdoors! 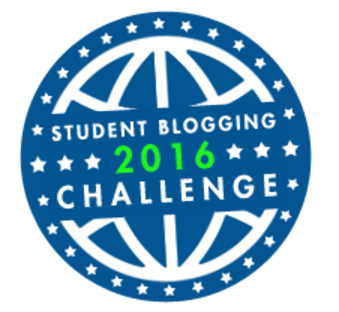 Student Blogging Challenge :: Playing Outdoors! 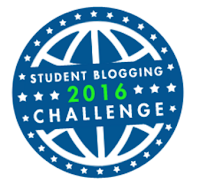 We are participating in the Edublog Student Blogging Challenge. For WEEK 4, we were asked to be one of several international groups who will share a topic of choice on their blogs. We can't wait to connect and learn about a variety of topics from a plethora of bloggers! Playing outside is a wonderful way to stay healthy and have fun! It is FALL here in the northern hemisphere, but the mild southern California climate makes for enjoyable outdoor fun! We play a lot of pleasurable games during recess and here are three we'd like to share. Although this silly "Down By the Banks" chant was filmed indoors, it is often played in the shade of a tree out on the grass. 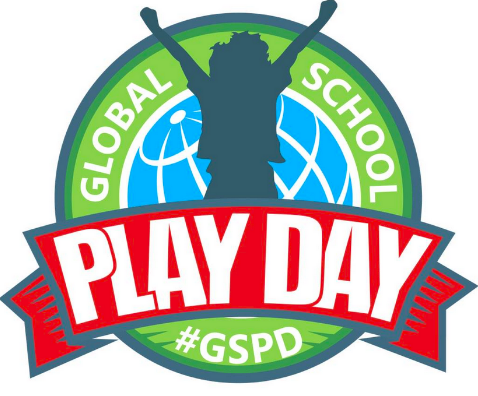 If you value play, consider joining the Global School Play Day in February. No electronics at school, just unstructured play. We participated in 2016 and 2015 and will join the global group again on February 1, 2017. 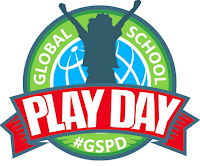 Sign up your class and learn more about it by following the Twitter hashtag #gspd. What are some games that you play during your recess? Is is fall or spring where you live? How does weather affect what you play? Please share a comment about a game or two you like to play. Better yet, share a blog post about ways you play at your school and leave us a link. We promise to leave a quality comment! I like those games.In Australia we call sour apple, squash.Do you have any other games? I like playing Squash/Sour Apple! I used to be in Mrs.Yollis's class, now I am at Mountain Avenue Elementary School. I recently moved. I still play some games from my old school, but I have not had a chance to play tetherball or Squash/Sour Apple ever since I moved. There are still tetherball courts at Mountain Avenue, but sadly they are only for 4th and 5th graders. We have been using typing.com, IXL, and iReady to do online homework most of the time. We do not usually do paper homework! My name is Sienna and I live in Sydney, Australia. I am in year 5. Normally we would have to play with our year group but at recess right now we are doing skipping and handball because of the season (Spring). Yes it is Spring in Sydney, Australia and next week on Tuesday it is 29 degrees. Some of my favourite games are Marco polo, tag and Skipping. I live in Australia, and it is Summer here. The weather affects what games me and my friend's play enormously. E.G. If it is rainy, then my friends and I will play "Follow the leader" or "Chinese changes" or "Party on the hill". If it is more like a normal, not too hot, not too cold day, we will skip or play something like "Double Dutch". One of my friends and my favourite game to play is skipping and "Follow the leader". Thank you so much for your quality comment! We are very interested in learning about "Chinese Changes" and "Party on the Hill". We have never heard of these games. Why don't you write a post about them and then we can learn from you! Mrs. Y♥llis smiled when she read "Double Dutch" because she used to play that in school. You take two long jump ropes and criss cross twirl them. It is very hard to do. Mrs. Yollis is going to get two ropes and show her students how to play. She hopes she can still do it! I've never played any of those games, but they seem really fun. In Indiana, we have things like carpet ball and a gaga pit. Your playground seems really fun and interesting. I would love to have recess at your school! Your questions intrigued me and our class is doing the student blogging challenge. 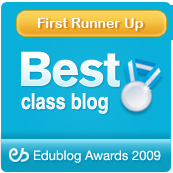 You and your class can visit my blog at, natalyaw23.edublogs.org. I thought the games the children at your school were playing look quite similar to some of the games we play. Your game sour apple was like our game fumball, but in ours you don't call someone's name and we also play a game called squash similar to sour apple and fumball. Is it fall or spring where you live? How does weather affect what you play? It is Spring where we live. The weather doesn't really affect where we play, because recently we have been playing hand ball undercover so that doesn't change, but sometimes if we’re playing something not under the cover then we have to go undercover if it's raining. I’m in year 5 and we usually play handball. If you don't know what hand ball is, it’s when you have four or six squares and you pass the little ball to each other by bouncing it and try to get people out. We also sometimes play on our equipment. Thank you for sharing some games that you play. It is funny that you play Sour Apple, but you call it Squash. Is it a popular game? What about the game called Bamboo? Is that a game that you knew about? It is a game that is good for endurance and upper body strength! How long is your recess at your school? At my new school I do not play Sour Apple, but I do play four square, something funny about four square at Mountain Avenue is that the court is not square! At recess we have three grades playing together, I play with my two friends at recess at recess their name's are Maya and Dagny they are very good friends. At lunch we play by ourselves because we only grade we play with at lunch are 3rd. Another friend we play with is Audrey. If they don't play Sour Apple, why don't you teach them! You mentioned that the "Four Square" court is not a square. Please describe it! What is the climbing equipment like at your new school? My whole school saw the NED show it is a funny show about Never Giving Up I really liked it there was a man named Andrew who was good at yo-yoing it was amazing,I wish you where there! I really miss being a cub I can not wait for Christmas because of our sleepover! Hope you blog soon. I am very exited about 2 things. First, today is my 3rd piano recital it is very exiting I wish the whole class could come that would be very exiting! Second, today is my friend Brandon's little brother's birthday party, his real birthday is halloween but Brandon Chaolin and I went to Allie's house to trick-or-treat it was very fun and today I get to see Chaolin again! It is a very fun packed day today, hope you blog soon! I hope you are having a great time I want to know how was your Halloween was it fun I know Chaolin's was fun because I was there I also know how Allie's halloween was it was fun at Allie's because I got to see my friends! blog back soon. I am very exited to tell you about my recital it was amazing I had already passed my exam so I had 3 stars, I played Arebescue, Wild rider, and Do-Re-Me I got a trophy along with all the other players it was very FUN! I hope you have a Red Ribbon Week, first there was crazy hair day then pajama day I will tell you 1 more it is sports jersey day it was the best week of my life! Yesterday I went to Mountain Avenue's halloween carnival, I won a lot of prizes.I won 1 sticker pack, 2 vampire teeth, 4 erasers, 2 gold dabloons, 2 notepads, 1 magniflying glass, 1 dreidel, and 1 maze.At my school kids can earn something called a spirit stick they are little sticks that you earn if you participate in school events! So far I have 2 spirit sticks one is for red ribbon week the other is for the carnival. Thank you for commenting on Mrs. Yollis' blog and keeping me updated on how you are doing. Your halloween carnival sound like our Fall Festival and sounds like a lot of fun. Were you able to go on any rides? What kinds of games did you play to win those great prizes? I love that you commented, on Halloween I thought you said you could not? I won those prizes by playing games at the booths! There were not many rides although I did go and play in the bungee house with my sister! I wish you could have been there at the Halloween Carnival! I think I showed you 2 of my prizes, I think I showed you a butterfly and eyeball stuffed animal. I hope you get a chance to meet my friends. Today I am going to Maya's house to do a science project for our schools science fair, we are doing a slime project! I really like all the games you have displayed. I think that sour apple is my favourite! My friends and I play it all the time. Thanks for making this post, now my class and I have some new games to play! Thank you for your terrific comment! We like Sour Apple too! What's a good game that we might not know? Where do you live? What games do you like to play other than Sour Apple? Thanks so much for replying to my comment! A great game to play is demons. It's like chasey but the 'it' person can only walk. When they get someone they they also become it. You can play this more traditionally and swap the 'it' person when someone gets 'it'. Sometimes when we do the modified version (the first one I explained) we call it demons gang up! Then the last person remaining wins. It's super fun, you should totally try it out! Where do you live? Any games my friends and I wouldn't know? You should come check out my blog! Leave me your blog URL and we can chat! I live in Dakar and during this time there are still a few hot days but mostly the weather is warm and slightly windy. I love this season because for me it is the perfect weather for going outside which leads me to my next point. Since I'm older now, I don't really play the games listed above but I do like playing basketball during our free time. It feels nice to get comments from all over the world! We can relate to you about the weather. It can be warm and slightly windy. But, sometimes, unexpectedly, it can be burning hot! Ex. 98'F! We read that you like to play basketball in your free time. What other games do you like to play during you free time? What can you tell us about Dakar? We looked it up on a map and learned that it is the capital of Senegal. We'd like to learn more from you. I'm currently in highschool, and I usually don't play at lunch I hang out with my friends. In Dakar, it's Fall but the weather doesn't affect me anyways. I only play games in PE class, and my favorite one are basketball, dodge ball, and capture the flag. Do any of your teachers use technology to teach, besides this blog? to play basketball during our free time. We don't hang out we play during our free time. We play dodge ball at P.E to sometimes. We like to play capture the flag too. What other things can you tell us about Dakar? What other games can you tell us about? I used to play "Down by the Banks" all the time at camp. It was so much fun for all of us, especially being able to play with the counselors. Because of our climate, the weather rarely changes. So, because it's mostly hot, the games we play rarely change due to it. A few games I like to play are four square, although that's more of an elementary school game. In middle school, playing old hand games with my friends is fun, because it brings back some nostalgia. Except we're usually talking instead of playing. On my blog, I've created a little paragraph explaining what games I play at lunch on my "ESBC '16" paeg. It would be awesome if you could check it out! Here is the link to my ESBC '16 page! 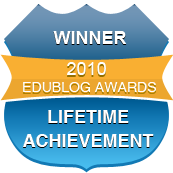 You are a great blogger! We loved your blog and will try to leave you a comment tomorrow. Dylan loves to play Sour Apple. She loves it because everyone gets a turn to play and run. Brianna likes jump roping. She can even jump criss cross backwards! Can you? What grade are you in? We are in 3rd grade. Can you also tell us what nostalgia is? Hi I'm Olivia from Australia. In Australia right now, it is Starting to get warmer as it is Spring. A game we play at lunch is called Demons. Demons is where there is one person it who can only walk, but everyone else can run. If the demon catches someone, they are it with the demon. When the last person has been caught the game is over. We really enjoy this game, and I really liked your activity! We think your comment is great! Demons sounds like an fun game to play during recces! Pac-Men tags you, you are out. Pac-Men. You must only walk on the lines painted on the play ground. What are some other games you play that you think we might enjoy? We like playing outdoor games! I love the game 'Down by the banks'. Though we do a slightly different chant. I normally play it at dance. We loved reading your comment! We play a lot of games at our school like soccer, basketball, handball, and football too. Preston likes to play tag, soccer and other games. Payden likes football and basketball. What country do you live in? We live in California in the United States. What a great topic of choice to think about. During playtime I quite like to skip, we have two girls holding the rope then we each take it in turns run in and jump once, then run out. Another game that we play is elastics. It's when two girls stand in a piece of elastic (joined at the ends) and then another girl stands in the middle and does different jumping patterns and if she gets the pattern right, she has to do it again but the elastic is held higher up. Thanks for the great comment about our games. What are your favorite games at your school? Enzo and I like to play handball. Do you know how to play handball? Enzo can do a mean slicy. A slicy is when you hit the ball so that it hits low on the wall. It is very hard return. I like that you posted somrthing you and everyone else can enjoy. Will you be posting any more videos like that? Thank you for the wonderful comment. We really enjoyed your comment! Do you know any games you could teach us? Did you learn any games from us? What grade are you in? We are in grade 3. We are 8 years old. How old are you? We think you live in Australia. Are we correct? At my school, we mainly play soccer and two touch.I have posted details about this on my blog and hope you can look at it. You can find my post at https://www.blogger.com/blogger.g?blogID=9180953622291658332#editor/target=page;pageID=8355265278015362395;onPublishedMenu=pages;onClosedMenu=pages;postNum=0;src=pagename. But it is all the way at the bottom so you may need to scroll down. @Danika, Thank you for a great comment! What is two touch?I'm 9 years old.I play soccer two! What is your favorite game? I love all of these games that you shoed here on your blog! A couple of my favorite games include four square and hide and seek! We have played four square, and hide-and-seek too! We also play tag and handball. These are typical games played around the world. Do you play any unusual games? We think you live in Australia because we got a lot of comments from there. Are you? What grade (or year) are you? Hello, At my school I play basketball and soccer with my friends. The video you showed me on the top of the page reminded me of another game that is similar to Sour Apples. There is this game called poison and I sometimes play with my sisters. The game is sorta simple, it's like basketball, First, you have to have a line and the fist person has to shoot it in the hoop. If the person shoots it in the basket that person has to run back to the fence or wall and say poison. When the ball shoots the others has to run as far as they can until the person says poison. Once that person looks back and finished saying poison the others also have to stop. The person that has the ball has to take only 5 steps and get to the closest person and try roll the ball to hit them on the foot ot leg. once they hit them you do it again, but if they missed rolling it, then the next person in line starts the next game. Wow! You are a terrific blogger! We loved all of the detail sentences about the game Poison. Sometimes we play a game called HORSE. First, you shoot the ball and if that person makes it the other people have to make it from the same spot. If the person misses it, they get an H, the first person who spells HORSE losses. Do you play any unusual games that we might not know here in California? I am a student in Australia. At my school, we play games such as handball, skipping and games like down by the banks. Instead of down by the banks, we have versions such as apple on a stick and party on a hill. I have never heard of sour apple or bamboo before. From the videos, they sound like really fun games. It is currently Spring in Australia and it is just warming up. The weather affects what games we play because if it is cold and rainy we would play inside. If it was sunny and hot we would play games in the sun. One game I like to play is handball with my friends. I loves watching all the different games that you made up with your class. I am definitely going to play some of them at lunch and recess. Im from Australia and its starting to get warmer as spring is slowly turing in to summer. My friends and I like to play a modified version of chasey (as my friend Olivia mentioned above) and sometimes we like to play basketball. I'm from Australia and it is getting warmer as summer is coming. The game most of the school is playing right now is handball, normally there is about 3 games of handball at a time. If it is our turn on the oval most of the boys and some of the girls love playing soccer. The game sour apple sounds fun and i would love the play it with my friends some time. Wow, I've never even heard of those games before and I your post is really good and I would like to play them. I'm 11 yrs old from Adelaide and I don't think anyone would think of paying these. 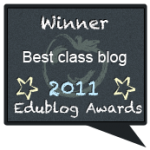 My blog is jessica56ma.edublogs.org and my teacher's is mrpastrosclass.edublogs.org. I hope to hear a reply from you soon. I think it was a good idea to do videos on the games instead of just typing them! Keep up the good work! At our school, we play hide-and-seek and infection. Infection is like tag but if someone gets tagged, they have to help tag the other people. I also noticed that sour apple is like poison. We also play poison. Poison is where everyone stands in a line and shoots baskets. If they make it they have to run to the pole and yell POISON! Wile they are running to the pole, everyone gets to run away. When they person yells POISON they have to stop. They get to take 3 big steps. Then they throw the ball. If they jit someone they get a "P." Once you spell out POISON, you're out. I live in Hawaii, and it is winter. However, Hawaii is always warm and hot that the there is no snow and the leaves don’t change color at all. The weather affects the way we play because we could easily get sunburn or pass out because of dehydration. Also, we can’t play any winter game/activities such as making a snow man or having a snow ball fight. Though it sounds sad, we still play normal games such as soccer or four square. I live in Sydney, Australia and it is Spring here. I play handball with my friends at recess and lunch. I really like how you showed the games in videos instead of just explaining them. I have learnt how to play bamboo and sour apple now as I had never heard of them before. 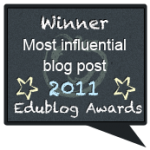 Please check out my blog at http://louisas23.edublogs.org/ and my class blog at http://year5rc.edublogs.org/. Hi, my name is Maddie and I live in Australia. At my school we play demons. It was made up by Alice, kascata and I a few years ago. It is tag except when you’re it, you can only walk. At the moment it is getting warmer since we are approaching the end of spring. This means we spend most of our time in the gym to stay cool. Come and have a look at my post. I loved your post about PLAY! I value how you took videos of fun games and you slowed them down and did a voice over to make it easier to understand. I learn't how to play three new games that I have never heard of before. At my school my friends and I love to play whole school chase. But last year one of my friends called Maddie invented a game called "demonds". It is an extremely fun game where one person is it and can only walk. Although it sounds like the it person will never get anyone they do because it is gang up so more and more people become it. Maddie is the best at being the demond because she always makes it scary, and hides in one spot then jumps out. In year 5 we used to play handball all lunch and recess. Yesterday my friends and I played your game called sour apple, it is heaps of fun! Where I live in Australia it is just coming into summer so it is a great temperature to play games outside. Sometimes it gets too hot so we go and play in the gymnasium where there are heaps of different games to play. PS The gym is where we played your game sour apple. Dear Mrs. Yollis, your post about play is very interesting, but very different from our schools recess. Our school has a variety of options such as carpet ball, Ga Ga, a soccer field, and a playground. This is nice because we get a variety of options. Ga Ga is a very fun game where there is one ball, and you have to try getting others out by hitting the ball at their feet. If the ball hits you waist and above you are still in. Your games seem very fun, and cool is this the main game you play at recess? Hello Mrs. Yollis, my name is Jovan, and I love in the United States, and it is Fall here. Right now when we go outside for recess, we actually play a game called "Ga-Ga." This game consists of people playing in an octagon shape pit. They have to hit a ball with their hands, and if it touches anyone's feet, they are out. There are also some other rules. You cannot hit the ball twice without the ball hitting someone else or the wall and you can't hit it out, or you're out. Our pit was made in Woodworking by our Woodworking teacher, Mr.Smith. I love going outside for recess because my school added some new items to our playground! One thing they added was a Ga-Ga. Ga-Ga is a game where you play dodge-ball below the waist, by slapping the ball. Another feature we add was carpet ball. Carpet ball is when you use pool balls and roll them across the table and knock the other person's balls down. Dear Mrs. Yollis, I really liked the bamboo game and the sour apple! those were my favorites from this list. Maybe you all should try plaing competative basketball with actuall teams that play against other classes and have finals and championships. That would be really fun for the kids I bet. Football would be a good idea too actually. The same kind of class against class action or for any type of sport that anyone wants. My name is Hannah and I'm from Vermont. The weather here is different almost every day. A few days ago it was like 70 and the next day it was in the 40s. My name is Madison Iḿ from Vermont. Our weather is cold most of the year.In the fall it is cold and colorful and in the winter it snows for the spring it is cold and damp for the summer it is hot for sports they come every season like soccer and foot ball are in the fall and wrestling is in the winter and softball is in the spring but none in the summer here is the link to my blog. I loved reading your blog! I am new to the question thing... so here's my attempt! Q: Is is (it) fall or spring where you live? How does it affect what you play? A: Where I live, it is fall. It is also about 30-60 degrees outside, depending on the day. I normally play on the monkey bars, but when its this cold outside, its too cold to play on the monkey bars. I choose to play on the swings with my friends instead. Dear Mrs. Yollis,hi how are you I loved your commenting video it was amazing!. I responded to this post in a post on my own blog. Here is a link: http://afascinatingblogbytaylor.edublogs.org/2016/11/02/big-booty-sbc4/ Enjoy! I have always see that yellow climber that you use too play bamboo and I have always wondered what it was for! Now I play bamboo all the time! I live in Canada and it is fall right now. With all the trees and leaves falling down,it is hard to play a game we play called Grounders. This is when there is a big group of large rocks- outdoor classroom- that are a big enough to stand on. Somebody is it and the rest of us stand on the rocks. The person that is it has to count to ten but has to keep there eyes closed the whole time unless they make it on a rock. Basically the "it" person is trying to tag everybody else. When they get on a rock the are allowed to open there eyes but not call grounders. When they are closing there eyes and on the ground they can call grounders. If the call grounders and you are on the ground you are it. You are also it if the it person tags you. I don't know if your class plays it but it is quite fun. If you want to check out my blog click on the link below. I live in Sydney Australia and it is spring right now it is to hot to play card games like we did in winter so now we play handball and skipping. My favorite game is handball but playing tadpole because you don't have to wait for a turn because you stand in a circle and everyone plays at once. I have been looking at all of these games and realising I have done none! I live in Sydney, Australia and I am in year 5. Normally during recess we like to play handball or skipping because of the season, Spring. The one called the bamboo is a really good game I will have to try it sometime. I don't know if your class likes to play handball and skipping because we sure do! I love your blog. I did not know that Bamboo was a recess game I might try it some time. My name is Chelsea and I am in year 5 and I live in Sydney, Australia. It is Spring right now and my class and I love to play outdoors. Games we play are skipping and handball, and much more. You can play skipping and handball in all weather because you can play undercover. With some games though, this is not possible. I liked the look of Bamboo, I liked how the crowed is cheering everyone on. I am going to share the Bamboo game with my friends but the only problem is what if you don't have parallel bars in your playground? Do you have any ideas? We are thrilled with the response we've received on our outside play blog post. Last week, we tried to respond to everyone, but were not able to do so. In an effort to be a good blogger, we are going to respond to each blogger on HIS/HER blog. If you left us a link, look for a comment over the week. 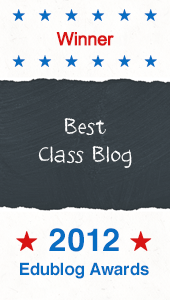 Leaving a comment on a student/class blog will help us connect with others, and let's face it, it is nice to receive a return comment on a blog. Getting a dot on the ClustrMap is a thrill too! Thank you again for your participation, and we'll see you on your blog! I hope you and your third graders have fun! I love playing sour apple and playing it at school with my friends. Hi, my name is Evan and I am from California.It is very hard to play some of my favorite sports because of the rain and the mud. I am 13 years old and I am in 8th grade. my favorite sport to play at lunch is football and basketball. and by the way i love playing sour apple! Hi, my name is Jena. At recess I play on my phone. I live in Honolulu, Hawaii. Here it is basically hot all the time, it was fall, but now it is winter. I would like to try bamboo and down by the banks. During Recess I usually play on my iPad! A few apps I usually go on are Snapchat, instagram, Best Fiends, Zig Zag and a lot more! I live in Honolulu, Hawaii. Right now it is winter. But a few months ago it was fall! So the winter here doesn't affect us cause it is pretty much hot year round! Out of the games you showed, I would love to play bamboo! It looks so fun! My name is Kayla and sometimes what we do at recess is just hang out in a class room and just hangout. I live in Honolulu, Hawaii. At night it gets pretty cold. The games sound very interesting. I will try to try them out at recess. Happy Halloween! :: Green Screen Fun!